The flu is much more serious than the common cold. Protect yourself and your loved ones from serious health risks with a yearly flu shot. They’re available at no cost to Kaiser Permanente members. Please call 1-800-573-5811 or go to kp.org/mydoctor/flu for updated hours and locations. Enrollment beginning October 15, for coverage starting January 1, 2019. Medicare eligible residents in Santa Cruz County will soon have access to Kaiser Permanente’s unique blend of high quality, affordable health care combined with award-winning health plan coverage. Kaiser Permanente is proud to announce it will begin offering a Medicare Advantage plan in Santa Cruz County, with enrollment starting October 15. Coverage will be effective January 1, 2019. To see a list of our facility locations and hours of operation for each medical office, click here. Meet Some of Our Santa Cruz County Physicians! More than 50 Kaiser Permanente specialty and primary care doctors are serving our patients and members in Santa Cruz County. As our membership grows, we’ll continue to add doctors. We’re proud to introduce some of our primary care doctors who have made the move. Medical care away from home. KP members get support anytime, anywhere! Planning to travel soon? The Care Away from Home Travel Line* at 951-268-3900 and the kp.org/travel website can help you plan ahead, travel well, and come home healthy. Whether you’re off on vacation, business travel, or have a student heading off to college, getting assistance is just a call or click away. Some things are easier to remember than others. 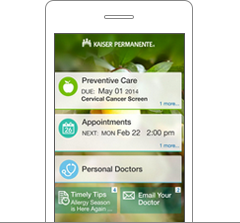 For Northern California Kaiser Permanente members, remembering doctor’s appointments and immunizations just got easier. For Northern California Members Only. 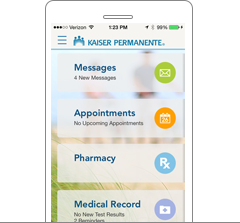 View your list of medications from your Kaiser Permanente medical record and set reminders to help you remember how much medication to take and when to take it. 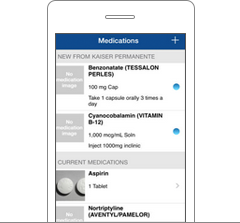 The redesign includes a colorful new interface, tools that make it faster and easier to use, and new quick-access menus that let you get advice, schedule appointments, and refill prescriptions.